C. Michael Dudash open and limited edition art prints and canvases of A Father's Heritage for sale painted by artist C. Michael Dudash. This canvas comes in a dark wood frame with linen liner and brass title plaque. "A Father's Heritage was painted as a result of my long felt desire to create a painting based on the precept of a father reading God's Word to his children. If we look beyond the obvious warmth and intimacy of the moment, we see illustrated a far more important event in the lives of the children and the father. The father is fulfilling his role as the one who is responsible to introduce his children to the Word of God. The seed of the Word is planted into fertile ground and now the Lord has the opportunity to make the seeds grow in His time, bearing the fruit of God's Spirit. "It's the responsibility of all of us, particularly as parents, to make sure that our children grow up with a love and a respect for what God says and to know that in life the Bible is our greatest source of wisdom, comfort and joy. The lives of the hundreds of characters that fill the Bible (a few of which are illustrated here) bring this Word to life and help make it relevant to parents as well as their children." A Father's Heritage copyright© 2007 by C. Michael Dudash is prohibited from being copied. C. Michael Dudash art, family, father's day, pictures, artwork, art work, canvases, images, paintings, pictures, and prints of A Father's Heritage by artist C. Michael Dudash for sale. 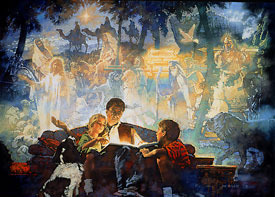 A Father's Heritage painting by artist C. Michael Dudash can be purchased in art print or canvas form at special sale prices at Christ-Centered Art.